That’s a common way people describe how their lower back pain started. At first, you don’t take it seriously, because the pain is relieved during the day and you go to bed pain free. I have a persistent and recurring lumbar pain in the morning. Isn’t it hard enough just to pull yourself out of the covers? Why does your lower back hurt every time you get out of bed and how can you make it go away – as soon as possible? 1 What Causes Lower Back Pain in the Morning? What Causes Lower Back Pain in the Morning? Why can you do anything you want during the day, even exercise, without any problems? Why do your back muscles hurt right after you’ve been sleeping and relaxing? 1. Sleeping involves two of the most common aggravators of muscle knots. Prolonged shortening or stretching of muscles (by sleeping in the same bad posture for hours) and tissue stagnancy (again, by not moving your muscles at night). 2. You have an underlying injury (pinched nerve, bulging disc, disc compression etc) which is aggravated by oxygen starvation and stagnation in the muscles while you sleep. 3. Blood circulation during sleep and right before we wake up is slowest, contributing to the oxygen starvation and tissue stagnancy mentioned above. Just imagine you have a tiny undetected hand injury. Now imagine falling asleep on this hand, cutting your blood circulation to it until it goes numb. Your hand would really ache when you woke up, right? The same goes with your back. Generally, the longer you sleep the more stiff you’ll be in the morning (unless you’re one of those lucky young people. They get away with anything). But even if you don’t have a tiny back injury, chronically sleeping in a bad posture can be the sole reason for your morning nightmare. A bad mattress will “support” a poor sleeping posture, so will a bad pillow. And if you happened to go to bed with pain – it’s going to get worse in the morning. Preventing lower back pain in the morning is not as complicated as you may think. If you take care of these 2 factors below, chances are you’ll be shocked to wake up pain free, with a smile of victory on your face. As you probably know, sleeping on your back, without a pillow, is the healthiest sleeping posture. But who sleeps like that? Only a few people find this sleeping posture comfortable. Most of us like to sleep on our stomach, or on our side, and some of us love to curl up on our side with our knees bent towards our stomach. Some of us unknowingly sleep in all kinds of awkward positions, which reduce blood circulation and cut oxygen supply to their muscles. The simple solution to bad sleeping posture? Your pillow is more than your night-time (bad) hair styler. A full body pillow (yes, the pregnant woman’s best friend) will keep you sleeping in the right posture through the night and your back muscles relaxed and resting. A good body pillow (like this one) is long enough to give you full body support and encourages you to sleep in the best position (on the side with a pillow between your knees). When your spine is aligned and the weight of your arms and legs is divided equally, your blood circulation is optimal and your muscles can fully relax while you sleep. You won’t believe how incredibly helpful a body pillow can be until you try it for yourself. 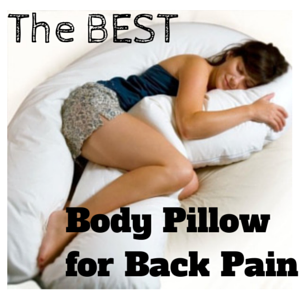 Check out my post about the top 3 body pillows for back pain to help you choose the best one for you. A bad mattress (too soft or too hard) makes your muscles “work” all night as they attempt to realign your spine. The good news is that you don’t have to spend your savings on a new mattress. A good quality 3-inch memory foam mattress top (like this one) is all you need to “fix” a bad mattress. It can instantly make any mattress more comfortable and supportive, especially in sagging areas. The memory foam conforms to your body perfectly, allowing your muscles to relax and reduce pressure points that make you toss and turn all night. Did you know that your blood circulation is the slowest in the morning? That’s why many people find that they’re back pain is relieved after a long and hot morning shower. The hot shower boosts blood circulation, that’s all there is to it. When your circulation is low, it’s like your muscles are not getting their breakfast. They’re not getting enough oxygen and other nutrients so they are not keen on waking up and doing their job. In a matter of 15-30 minutes, a good infrared heating pad will naturally boost the blood circulation to your back muscles and help you get out of bed pain-free and go about your day. Infrared rays (part of the sun’s natural light spectrum) penetrate deep into your muscle tissues (unlike the regular electric heating pad, which only heats your skin), and immediately promote your blood circulation in the area. All you need is to set your alarm clock to 20 minutes before your wake up time and place your infrared pad under your lower back. Relax and think happy thoughts about your new day while the infrared heat relaxes and softens your back muscles. I believe that an infrared heating pad is a must have in every home, and you won’t believe how many other benefits and uses it has. Here’s my post about the top 2 infrared heating pads right now, and why they’re so incredibly helpful for all kinds of pain. There is still no cure for mornings, but there are simple and effortless solutions for lower back pain after you get up. Fixing your sleep posture by using a good body pillow and a quality memory foam mattress pad, and boosting your blood circulation using infrared heat can make a morning person out of you yet. I’d love to read your thoughts and your personal experience with morning back pain, what has worked and hasn’t worked for you and any questions you may have – in the comments below.